Spring is around the corner and Vorsteiner and Wheels Boutique’s Twin-Turbo 911 is the ideal car for afternoon drives. 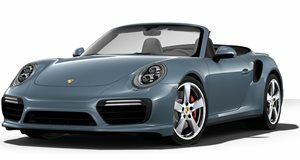 The Porsche 911 Twin-Turbo Cabriolet is an awesome model straight off the lot, however Wheels Boutique has added their touches to create a perfect open-top car utilizing Vorsteiner parts. Just in time for spring, the 911 TT Cabrio features a Vorsteiner front bumper that does away with the factory fog lights and headlight washer bezzles but adds carbon fiber air intakes and a wider Vorsteiner rear bumper with larger side intercooler extraction vents for improved airflow. A molded carbon rear diffuser and twin aero fins are integrated into the bumper with quad sport exhaust tips. The company&apos;s bespoke rear deck-lid and wing were modified to work in conjunction with the 911 TT Cabrio&apos;s soft-top roof. It sits on a set of gaudy-yet-gorgeous gold wheels. Check out the Vorsteiner Porsche 911 Twin-Turbo Cabriolet with Wheels Boutique touches below.